Vinyasa y Vino. Yoga & Wine. Two of my favorite things at one party = one great birthday. 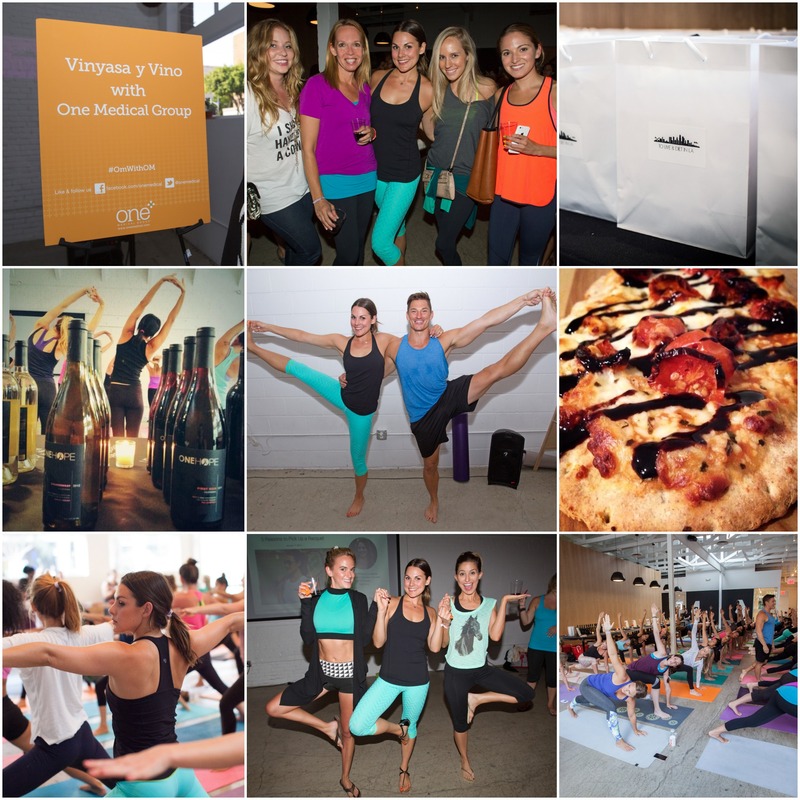 On Tuesday night I threw To Live & Diet in L.A.’s very first event, Vinyasa y Vino, with my co-host One Medical Group, and I have to say it was pretty awesome. The party was a fitness-meets-networking, summer kickoff celebration for my friends and healthy living influencers in the LA area, and it conveniently also fell on my birthday. 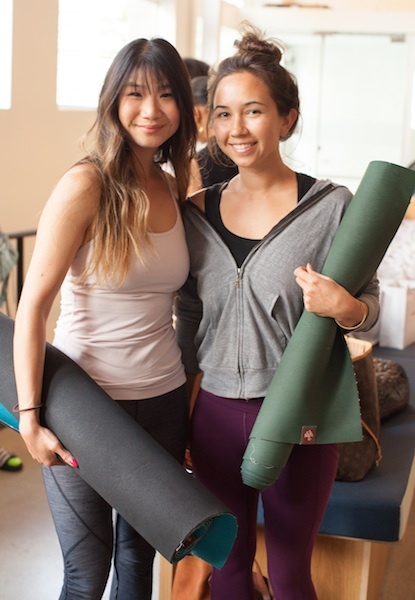 The party was held at General Assembly in Santa Monica, and started off with an invigorating Vinyasa class led by my favorite teacher Jake Ferree of Aura Yoga. 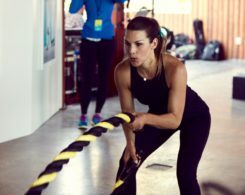 I’ve been to many workout events in the past where the class is kind of a joke, and you don’t even break a sweat. This was not one of them. Everyone in the class was drenched by the end, and a few of the guys even stripped down. Post-class, we refueled with an amazing selection of flatbreads, and cooled down with well-deserved — but still diet-friendly — frozen greek yogurt bars from Luvo. 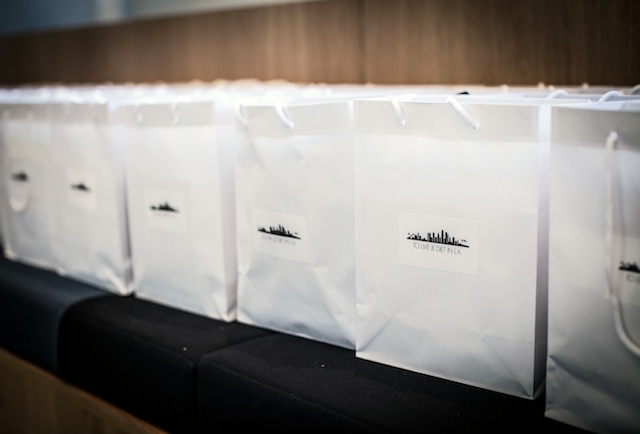 Luvo also handed out goodie bags filled with their delicious, flash-frozen meals, perfect for busy professionals who want to stay fit but don’t have time to cook. 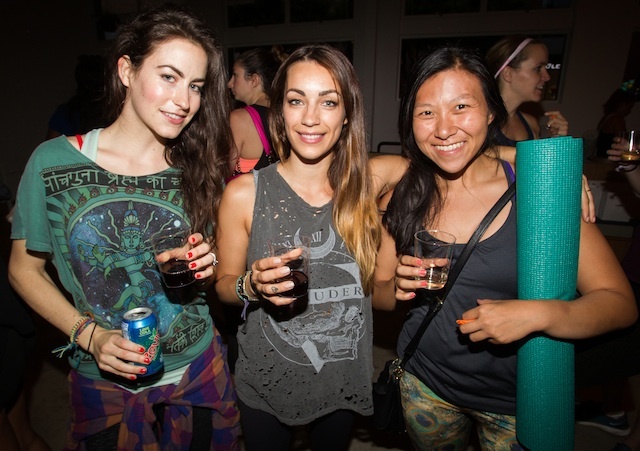 Unlike those other easy-going exercises events I mentioned, the post-party was as high-energy as the yoga class. One Hope at Home had the wine flowing and and everyone stayed well into the evening to mingle and celebrate summer. A few creative yogis even figured out how to officially incorporate their beverages into their practice. They’ve dubbed this “The Merlot Pose.” I like it. We finished off the night with a raffle including a bunch of swag from Manduka, Lululemon on Robertson, and De Rex Actionwear. 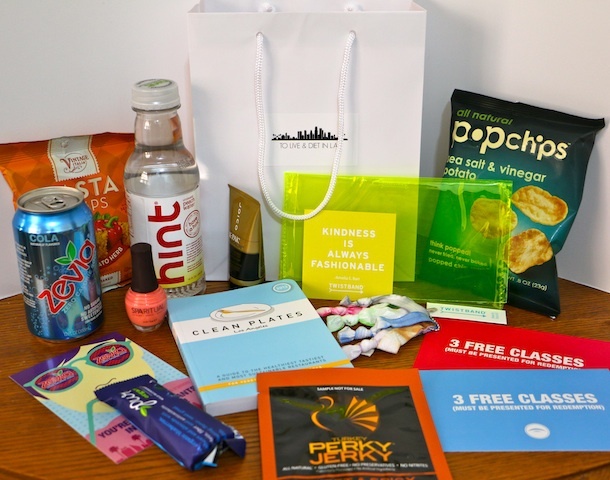 And of course, everyone took home a To Live & Diet in L.A. gift bag filled with goodies from my favorite healthy living brands. Since the success of this party is most certainly attributable you — the amazing people out there who read and support this blog, not just the ones who live & diet in L.A. — I’d like to share the love with all of you who weren’t able to be at the party in person. 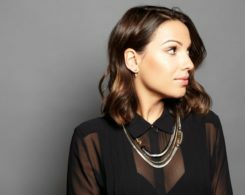 Today I’m giving away the last swag bag from the party! Inside you’ll find: SpaRitual’s new summer nail color, a collection of Twistband‘s tie dye hairbands and a bright yellow mini-bag to keep them in, Joico‘s K-Pak restorative treatment, Clean Plates‘ guide to healthy LA restaurants, three free classes to Aura Yoga and to Aura Cycle, Pure Bars, Perky Jerky, Hint Water, Popchips, Zevia, and Pasta Chips. Head over to Instagram. Make sure you’re following me, then “like” today’s photo of the giftbag, and comment below to let me know you did so! The winner will be chosen on Monday. Finally, because I love you guys so much, I’m giving all of you one last thank you gift for being such loyal readers. 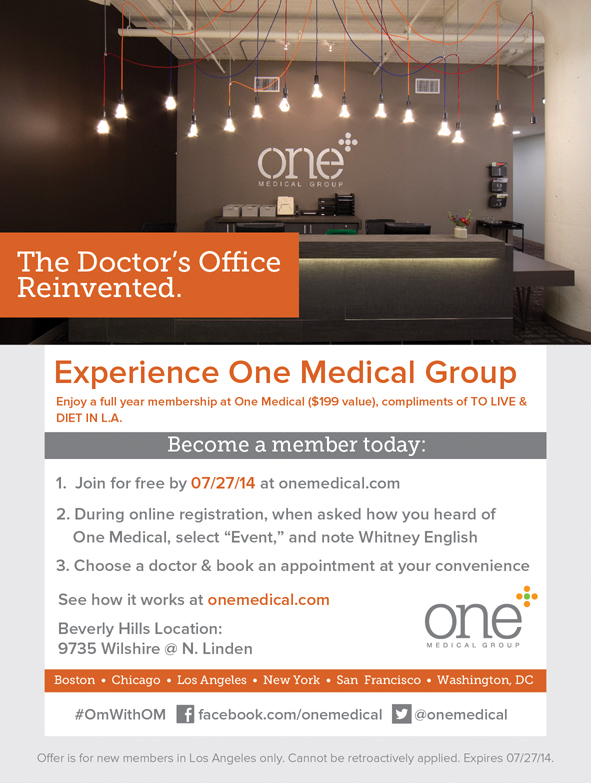 One Medical Group, the co-host of the party, is offering a FREE one year membership (usually $199 a year) to all To Live & Diet in L.A. fans. They’re a new primary care doctor’s office in Beverly Hills offering concierge-like service. You can download their app and make appointments 24 hours in advance and email your doctor directly. It’s pretty amazing. You can read more about them in this detailed Forbes article. Sign up is super simple. Do it HERE before July 27th to receive a full year of hassle-free health care. One last humongous thank you to all of my friends who attended the party, all of the event partners, and to all my healthy living blogger buds: Katy of Joy Laughter Sweat, Cristina and Kirsten aka The Pound Girls, Jessica of DressJessXO, Kasey of Kasey’s Kitchen, Julie of Julie Goes Healthy, Leah of Ask Leah Renee, Gigi of Gigi Eats Celebrities, Julie of Julie’s Kitchen, Gillian of That’s G, and Ashley of The Broccoli Blog. Thank you to my wonderful fiance for his support and to my amazing friend Leah, a publicist who throws parties like this for a living and whom I wouldn’t have been able to do this without. And last, but certainly not least, thank you to my readers. Without your support, To Live & Diet in L.A. would just be another starving blog trying to make it in the big city. UPDATE: Congratulations to swag bag winner @celinaeliz! Weigh In: Who wants a swag bag?! Had such a great time on Tuesday! Wish I was in LA to enjoy these events! Liked the IG photo. Thanks so much for having this event! It was great! Looks like everyone had a great time! I wished I was in LA!! Looked like so much fun & sorry I missed it!!! Definitely read up on One Medical. The Forbes article I linked to above gives a great overview. I think their approach to primary care is really the way of the future! I need to figure out a way to live with my family and do all the things I have to do here but still be part of fun events like that one – maybe my 15 year old really is on to something with his talk of time travel!! I liked your instagram pic (lacers522). Looks like an amazing event! 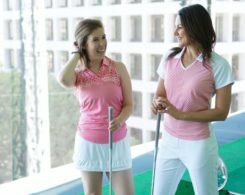 As a loyal reader of this blog from back in the good old days when it was just 20 or so of us, a big thank you Whit, for the wonderful recipes and workout info as well as your god given talent in calorie calculating :) I am so happy to see it taking off! And that people are finally realizing a good thing!!! This event looks awesome! 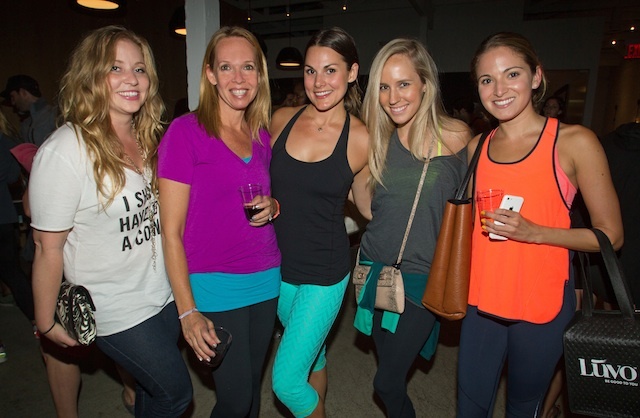 Yoga and wine are definitely two of my faves, so I’ll have to keep my eyes posted for your next one. Also, the idea of a pasta chip sounds perfect for my carby PMS cravings!